Search, shop, and save when you buy online. Need hoses tomorrow? We’ve got you covered. 100 years of business - 100 years of customer service. Why choose Amazon Hose & Rubber Company for your hose supply? For the same reason that people have counted on us for all their hose needs since 1919. When you deal with us, you get more than the best hoses and couplings money can buy. You get a commitment from people who take their job – and yours – very seriously. Whatever you need, we can get it. Whatever we give you, we stand by it. We’ve been making that promise for the past one hundred years. And now we are making it to you today. As a family-owned business run by three generations of women, Amazon Hose & Rubber Co. holds multiple MWBE certifications and can help you meet your MWBE participation goals. Amazon is a leading distributor of all types of hydraulic hose, and can provide complete hose assemblies as well as bulk hose and hydraulic fittings. 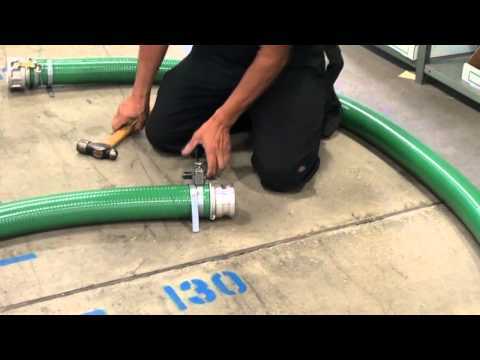 Air hoses deliver air to a wide variety of tools. Applications include in-plant usage, construction, mines and quarries, shipbuilding, and automotive repair. Water pumps have inlet and outlet ports. Water discharge hoses are connected to the outlet port of a pump in lengths that can run up to thousands of feet.